The SIDI Comfort Fit Insoles are genuine replacement parts for SIDI shoes. Whether they're worn out or just getting rank, pick up a pair of these supportive foam insoles. For half sizes, purchase the next size larger and trim to fit. My Sidi original insoles seemed flat. BTD had the Sidi comfort fit insole, I ordered, they arrived, I replaced, I rode. No cutting, trimming, or folding required. The best thing about Sidi shoes is you forget them - they just work. The insoles fit, don't take up too much space and will probably give me another two seasons of riding. I am on my third pair of Sidi and cannot say enough about the shoe quality but this insert under whelmed me. For the price they really did not do anything that the old ones did but I guess the smell better. Thin, not much different than stock. I would consider these as replacements for worn out original insoles but not much of an upgrade. They are very thin and as the other reviewer said, offer no arch support, aren't moldable at all, etc. Just be aware of what you are getting. 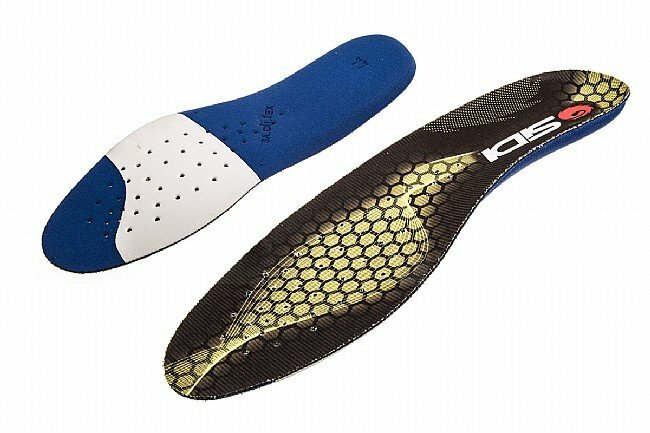 Not much to say here - these insoles feature a metatarsal reinforcement and anti microbial treatment (possibly some more heel support) vs. the stock insoles. Sidi insoles are kind of a joke and these should come stock on a [$] pair of shoes, but I digress. Bottom line, if you need some metatarsal support get these, they are cheap and fit perfectly in the shoes. If you need tons of options for arch support, look elsewhere. Sidi shoes last (almost) forever. Insoles do not. I refreshed my trusty Sidi Genius shoes with Comfort Fit Insoles and it changed my life.